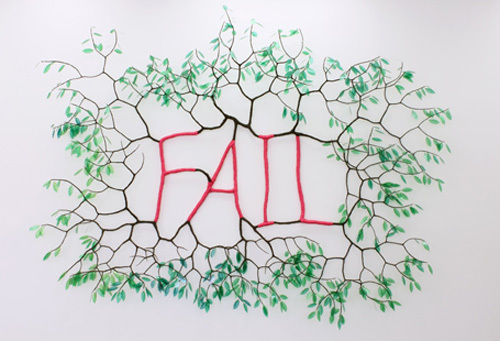 Macha Suzuki, Permission to Fail, 2010, mixed media, 90 x 116 x 20”. With “Permission to Fail,” Macha Suzuki takes his idiosyncratic blend of craft and dreamlike imagery to new levels. The introduction of figurative sculptures accentuates the surreal and contemplative sensibility that was hinted at in his earlier work but subordinated by slick surfaces and formal beauty. In Just a Tree (all works 2010), a character based on the artist stands near the gallery entrance; ordinary save a modeled tree trunk for a head, he offers an oversize handmade gem with outstretched hands. Constructed, like all of Suzuki’s work, from simple materials including wire, medium density fiberboard, pipe cleaners, and pebbles, the sculpture stands on a base that seems to float slightly above ground, emanating a yellow-orange light. On its own, Just a Tree, or any of the figurative pieces, would be strange and beguiling, but within the context of this exhibition, the laid-back aesthetic of these clothed sculptures reframes the cool distance of refined works like Blessings in the Skies, a pair of luminescent white birds, each with only one wing, hanging from the ceiling as if flying in tandem, and Nice Try, which comprises two targets, one black and one white, painted with neon-bright concentric rings and flocked by arrows piercing the rim from all sides. The title piece, Permission to Fail, comes close to providing a singular narrative by which to read the exhibition but, as if heeding its own advice, wisely stops short of that. Rather than supplying answers, this exceptional body of work posits the possibilities of process and even failure as alternatives to ambitions for the hyperreal success idolized by capitalism. One can easily surmise that even without the recent collapse of global financial markets, Suzuki’s point of view would still appear more humane, more layered, and more fun.